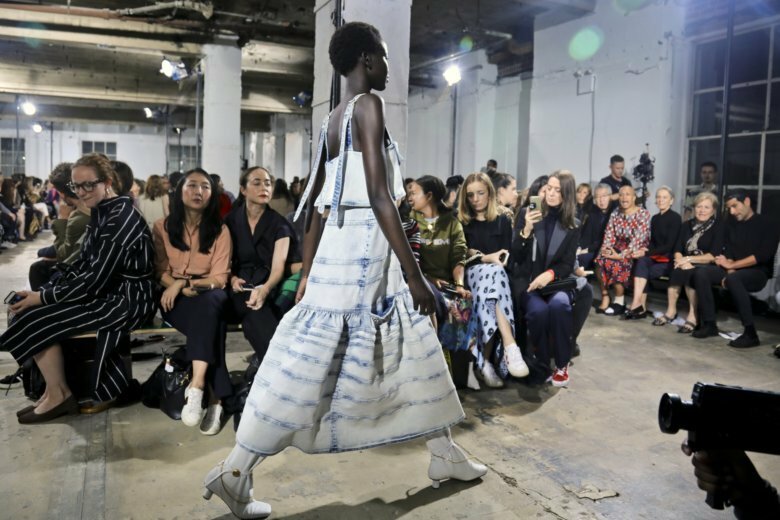 With their new collection unveiled Monday, they’ve gone all-American in spirit: denim, denim and more denim, with almost no embellishment — no embroidery, feathers or sequins. And though the fabric came from Japan, the collection was entirely made in the United States. The collection featured voluminous denim dresses , jackets and skirts, with the latter often covering thigh-high boots. In the place of embellishment techniques, there was tie-dying and acid washing. As for accessories, there were Western-style, bandanna-like scarves across the neck, and tote bags so large it seemed one could fit another human inside them. This season, the duo also collaborated with Berlin-based sculptor Isa Genzken — “one of our idols,” Hernandez said — for inspiration. When guests entered their show in downtown Manhattan, they were confronted with a large installation by the German artist of mannequins dressed in bits of Proenza garments. While the duo was happy to be back in New York, they weren’t ruling out showing again in Paris one day — or somewhere else. An advantage of the new pared-down style is that some items are now more affordable than some of Proenza Schouler’s more elaborately embellished garments. McCollough noted that one of the biggest sellers of a recent Paris collection was a long-sleeved, tie-dyed dress priced lower than some bigger-ticket items — which also turned out to be the most attention-getting and most photographed look.